Respects the skin's natural defences. 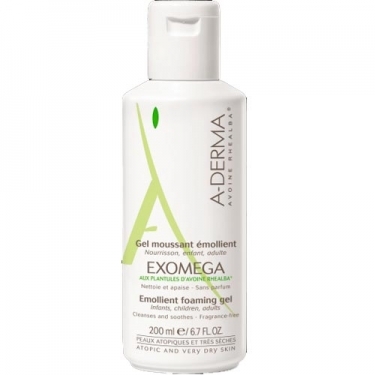 DESCRIPTION: Exomega Emollient Foaming Gel from A-Derma is a shower gel moisturizing in foam for daily hygiene, for body and face, suitable for dry skin and atopic skin. 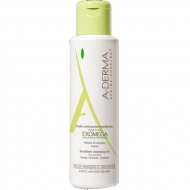 With rhealba oat extract that softens and soothes irritated skin. 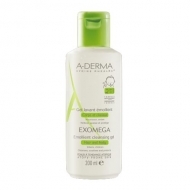 With Filaxérine, a unique combination of Filaggrin-inducing substances and omega-6, essential fatty acids that help restore the epidermal barrier. 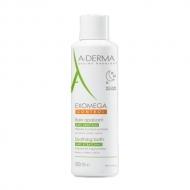 Glycerine that helps keep skin hydrated. With skin pH it helps to respect your natural defences. Does not contain soap. No perfume and no parabens. Rinse and dry the skin gently.